We provide a comprehensive package of professional services, training and support options with one thing in mind—your success. Our support team brings a wealth of experience and best practices from the recycling and forest products industries to quickly get you up and running and help ensure that you get continuous value from your investment in cieTrade. Each cieTrade client is setup with their own support team members that are knowledgeable about their account and help oversee and prioritize cases, arrange software updates and conduct training. cieTrade clients get unlimited access to our help-desk to quickly answer questions or resolve technical issues. Open 8:00AM – 7:00PM ET. 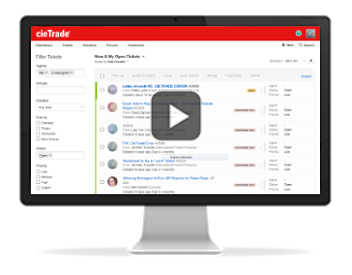 Our support portal is a great place for cieTrade clients to submit cases, get updates on existing ones, and propose ideas for new features that you would like in upcoming releases. Our training programs are tailored to the specific needs of your business and are packed with live demonstrations, participant interactivity, reinforcement discussions and hands-on exercises to jump-start your team's performance and drive results. Train-the-Trainer services are also available to ramp up internal instructors on how to educate your user community. Online Training offers you maximum flexibility with minimum cost, allowing you to schedule training sessions around the availability of your staff and for nearly any duration. Using our online meeting tool users can participate from practically anywhere using either their PCs or Macs. On-site training and consulting services help deliver the greatest return for your IT investment by allowing us to work directly with your instructors or key operations and finance staff. It helps improve communications to promote a greater understanding of business requirements and solutions, build relationships that enhance the training experience and helps build motivation for a successful implementation. Updating your cieTrade system to the latest version is never a problem and our update policy also adds value to your software investment by preventing you from being locked into old versions that can’t easily be updated. Authorized users simply request a software update from our support team and schedule it for whatever time is convenient. Our updates are automatically installed without the involvement of IT professionals or support staff providing users with instant access to the latest features or enhancements as soon as they login.